+This site became Commercial Hotel and then Star & Garter and then Ship again. 1857 Burnt down. New location refused. 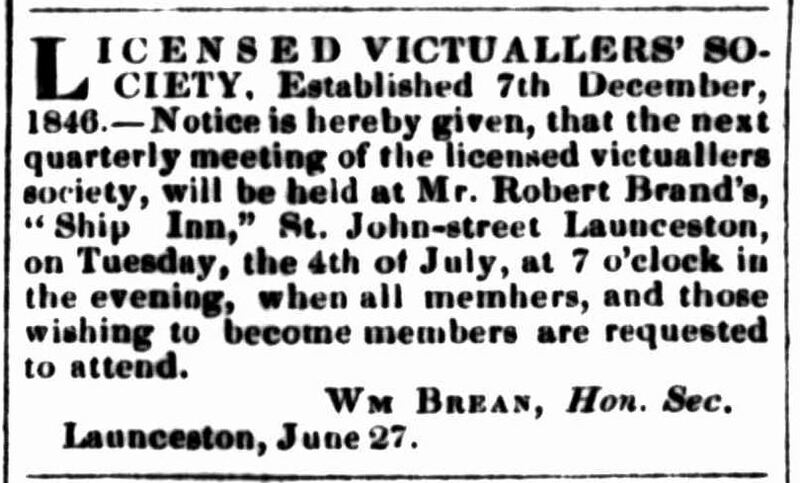 In 1824, Nathaniel Lucas, Ship Inn appears in the list of licenses granted, and he is advertising the premises shortly thereafter although there is no indication of the location. 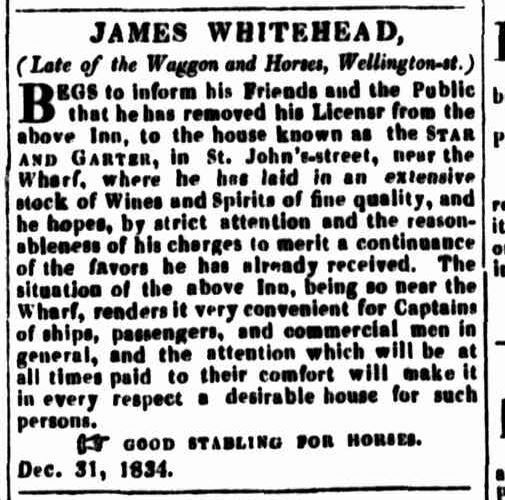 The next mention of a Ship Inn is 1829 when the licence is transferred from John McDiarmid to Patrick Carolan. There’s insufficient information so far to determine if it is the same house as that occupied by Lucas. 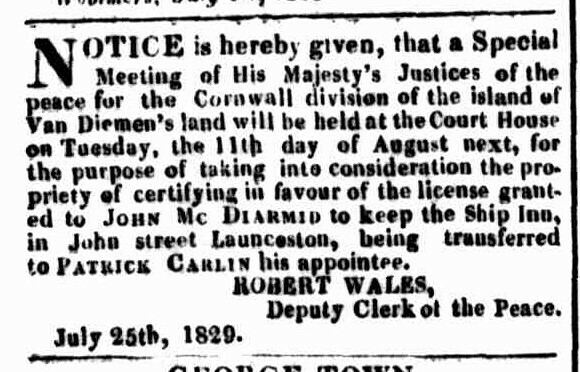 Mr. Mc Diarmid is an Inhabitant of Launceston, who after having with honor to himself, and satisfaction to the Public, conducted himself from his arrival in the Colony (and at home he was highly respectable) became about the year 1827 a Licensed Victualler. 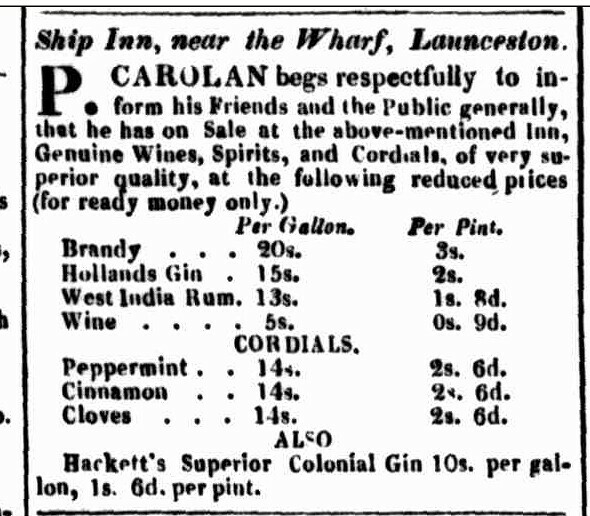 He however found a public business not congenial to his feelings, or even consistent with his habits as a Practical Brewer, and therefore in September last relinquished the Ship Inn in favor of Mr Carolan, since which he has supplied the Town with Ginger Beer by wholesale quantities. From James Whitehead, lo Robert Brand, the Ship Inn, St. John-street. HORTICULTURAL CURIOSITY.-Mr. Brand, of the Ship Inn, has suspended in his bar a turnip, in which an onion seed was planted. Both the turnip and onion are growing luxuriantly, the only nourishment they receive being an occasional supply of water. The curiosity, if it may be so called, is worthy the inspection of horticulturists. 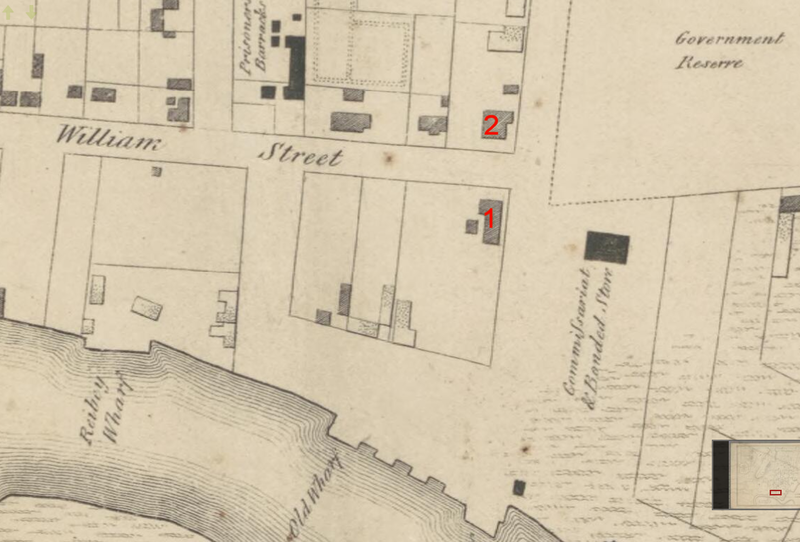 In the list of original licenses is omitted, R. Brand, “Ship Inn,” St. John-street;” against which the police magistrate said he had not a word of objection. Very neat, clean, and in good order. And W. Kitson, “Launceston Hotel,” Brisbane-street. Both granted without hesitation. Hay Market. — The first load of straw brought into Launceston market in London fashion, was by Thomas Hunt, a tenant of J. Cameron, Esq., Newnham. East Tamar, and purchased by Mr. Robert Brand, of the “Ship Inn,” .Launceston, but not at London price! Wheat from the Westward.— -Mr. Robert Brand, of the ‘Ship Inn,” St. John-street, has in his possession 35 ears of wheat on one stool, grown on Mr. Boucher’s farm, on the Quamby Estate. Mr. Robert Brand —Our obituary to-day contains the death of an old and much respected colonist, Mr. Robert Brand, of the Ship Inn. Mr Brand has been about thirty years in the colony, the principal part of which has been passed in Launceston. He was a high-minded and honorable man — most charitable to the deserving poor— and has left a widow and family of eight children to mourn his loss. Thomas Wells, Ship Inn, corner of St. John and William-streets. No objection. Granted. Fine at the Ship Inn. — About half-past 1 o’clock on Sunday morning, Mr. Thomas Wells, landlord of the “Ship Inn,” at the comer of St. John and William-streets, near the Queen’s Wharf, was roused up by cries of fire, and on going to a room called the snuggery, found it taking fire from the roof. At first, he believed that by keeping the doors closed to prevent a current of air from increasing the extent of the names, that he would be able to extinguish them with what water he had on the premises; but he soon found that they had got too strong a hold of the roof, and he immediately gave the alarm to the public. Although I hero was not the slightest wind, the flames spread rapidly over the building, (which was a long wooden cottage with verandahs), and before any of the fire engines arrived, there was little hope of saving even a portion of the dwelling-house. It was nearly low water at the time, but after some delay, the end of the hose of one engine was got into a boat, and a full supply was thus obtained. As usual very little was obtained by water carts, the old reason being given, that the owners never got sufficiently paid for such work. The skittle alley attached to the northern end of the house, was close to a wooden piggery, which nearly reached to Mr. Fisher’s fence and stores;— and thus again that gentleman’s property was in imminent danger. He considered the matter so serious, that he removed his office books and papers, and other property. The flames however, were stayed in that direction by young Taylor, (who is ubiquitous at every fire near the wharf) and other persons knocking off the roof, and pulling down the premises where Davis, a shoemaker resided, next to the “Inn.” The inn itself was totally burnt to the ground, with the exception of the stables and detached kitchen. The remains of it wore smouldering during all Sunday, and in the evening the Cornwall engine was again brought down to play upon a large quantity of half burnt limber and other combustibles which had fallen into the cellar, and began to burn tip briskly. The Ship Inn was the only good habitation between that and Mr. Fisher’s residence on the Wharf. We understand that it and some adjoining buildings, the property of Mr. Barnes, were insured by the Cornwall office for £1300 ; and Mr. Wells had his furniture and stock insured in the Tasmanian office for £500 Early on the morning of the 19th ult. Constable Templar found a bag containing matches, calico rags, and other materials ignited on the roof of Davit’s house, next door to the Ship Inn. We noted the matter at the time as an “attempt at incendiarism.” The bag, with its contents, was taken to the watch-house, and Davis stated that about a week previous to that, a similar attempt had been made to set fire to his premises. It was clone to Davis’s roof where the Ship Inn first caught fire, and there was no fire or light near that part of the inn at the time. In consequence of these facts, the Police Magistrate, as Coroner, has been requested to investigate the matter, and an inquest for that purpose is to be held at the Police-office at & o’clock to-day. 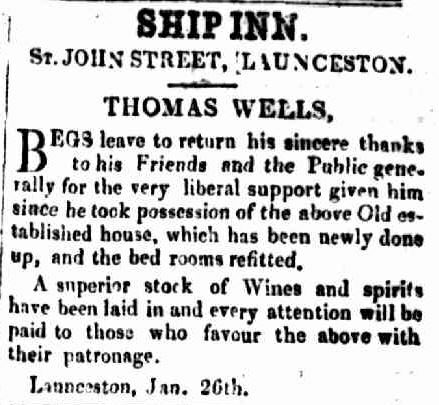 Thomas Wells applied for a transfer of the license of the Ship Inn to a building opposite the Post Office, at the corner of Patterson-street. The Ship Inn, as most of our readers are aware, was recently destroyed by fire, the business having since been carried on in a small building on the ground. The question therefore arose as to whether the magistrates could receive an application for the transfer of the license to a new building in another locality. Mir. Miller, for the applicant, argued at some length in support, and urged that the traffic in tile proposed locality justified the granting of a license in it. The chairman observed that under a former law the Police Magistrate was empowered to authorise the transfer of the business under certain circumstances to a new house; but it was not so under the existing law. The section respecting transfers, though somewhat ambiguous, appeared to refer to the house, not the individual. That was his own opinion. There appeared to be a defect in the Act in that respect, and the question was, had the justices power to remedy it? He thought it would be a wholesome power to give to the bench ; though possibly in withholding it the legislature had been influenced by a desire to protect the rights of property, inasmuch as a tenant might remove his business to other premises to the injury of the landlord. Mr. Miller said some difficulty had arisen with the landlord in this case respecting the re-erection of the premises, but as it could not be determined without resorting to legal proceedings, the applicant had adopted the present course. The Police Magistrate said he thought the bench had clearly no power to grant the transfer. The application was really for a new license for fresh premises. After some further discussion the application was refused. Thomas Wells, Ship inn, corner of George and Patterson-streets. The Police Magistrate said the house was not fit, and not required. Mr. Miller urged the claims of the applicant, who had been burnt out of his house on the wharf. Mr. Sams and Dr. Casey supported the application. Mir. Jennings thought the house would be a public inconvenience in the locality. Refused, as not being necessary. The unenclosed block of land where the “Ship In”‘ stood, is intersected with chasms of from two to three feet deep (the remains of the old foundations of the building) well lined with glass bottles and other dangerous missiles, and if a stranger or other person going from William-street to the Wharf, were to lose his way by night, he would fall from an eminence off the pathway of some feet, and in all probability, have little more notice taken of him until the coroner and “a jury of good men and true” sat at an inquest to Inquire into the cause of how and by what means he met his death. This entry was posted in Hotel, St John Street, William Street and tagged location, long gone, no photo by Xenith. Bookmark the permalink.